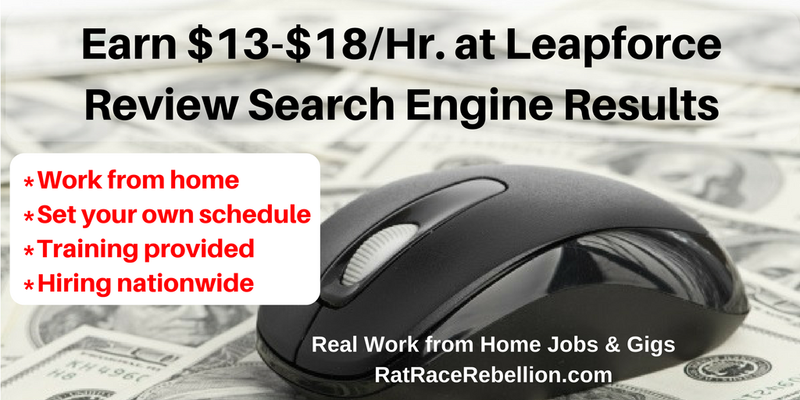 Leapforce, a legitimate hirer of work from home agents, continues to advertise for Search Engine Evaluators. Pay is reportedly $13.50 – $18/hr., though Leapforce hasn’t confirmed this. Set your own schedule. No landline phone required. In a nutshell, after virtual training, you’ll be doing search queries and evaluating the results. As one stay at home mom said on Glassdoor, “The work ranges from pretty boring to pretty interesting and challenging at times…You will be paid $13.50/hr and sometimes up to $18/hr was offered on certain projects.” Reviews give the company 3.4 stars out of 5. Requirements for the “ideal” candidate include strong research skills, familiarity with what’s happening on the web and in the media, and a college degree or equivalent experience. Leapforce pays monthly, and the job status is independent contractor rather than employee. Training is unpaid, but there are no fees charged. Workflow may fluctuate, so you may want to do this as a supplemental gig. To learn more about the job, click here. Good luck! This entry was posted in Independent Contractors, Non-Phone Jobs, Work at Home Jobs and tagged Leapforce. Bookmark the permalink.